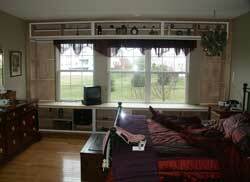 Contact us for details on our affiliates that handle custom kitchens! 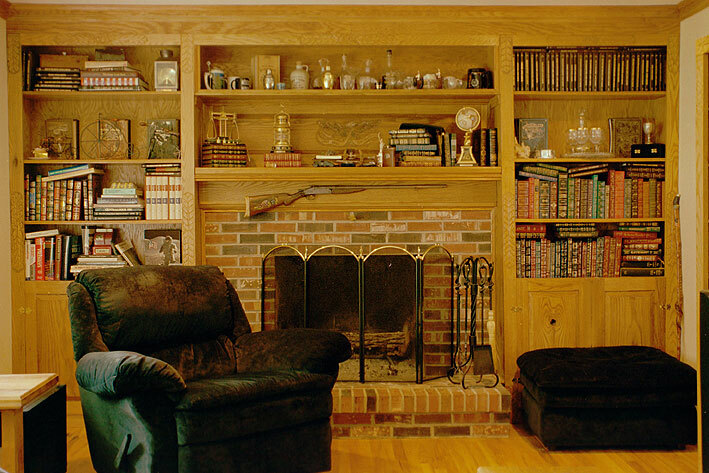 Built-in furniture is a part of the home, a traditional for centuries crossing all styles of architecture, this practice spawns fireplace surrounds, libraries, corner cupboards, bar units, kitchen cabinetry, and most recently home theaters. Blending functional furnishing into the architecture of our homes provides our possessions and treasures a residence of their own. 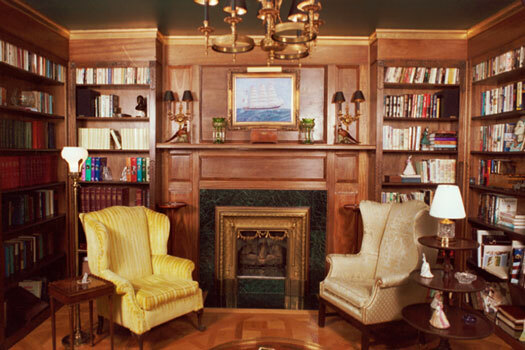 There is nothing nicer than sitting by a warm fire, observing the wood mantle and fireplace surround displaying collections, or enjoying the rich look of a wood library stuffed with leather bond books. 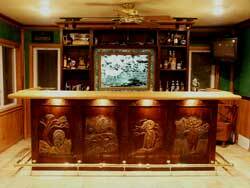 Artisans of the Valley has thirty years of experience in producing just such a look and feel. We can provide design, production, and installation services for custom woodworking to suit your needs and we are now affiliating with local commercial shops to provide services for larger scale projects than previously feasible in our small shop. It is our goal to produce custom built in furniture in the tradition of great craftsmen of the past, while considering the practicalities of today. The quality must be maintained, we insist on substantial materials and probably use more decking screws in our bookcases then most people have in their whole deck. No sagging shelves, no separating drawers, and nothing but full extension ball bearing drawer slides. If you want a unit in MDF or 1/2" plywood - please kindly find someone else for your project! Solid wood is traditional for built-in units; we love to create true works of art taking full advantage of the beauty of nature's best products. However, rising costs and dwindling forests prevent most people for affording such a luxury today. For this reason, we produce many of our modern built-in units using high quality plywood, enhancing the piece by using solid wood only for moldings, frames, paneled doors, and wherever carving or routing is required. The result is a solid, warm, affordable unit that is barely distinguishable from completely solid units. Standard twelve-inch shelf lumber in hardwood is becoming scare and difficult to find, making additional joint work a requirement. Joint work means plaining and sanding, this means starting with 5/4" stock to reach a 4/4" finished product. Plywood is commonly available in oak, birch, walnut, cherry, and mahogany. We offer solid wood banding, 3/4" tick allowing the appeal of hardwood with a true beaded edge, while reaping the cost and environmental benefits of plywood. Reaching a stage in his apprenticeship where "case" products were his specialty in 1999. Eric began the task of turning his house into a home. Taking advantage of his skills as a furniture maker, he is still busy installing an array of custom pieces including an oak fireplace surround, a home theater, a fully functional walnut bar unit, and a customized quarter sawn oak commercial kitchen. Detailed discussion and sometimes educating our clients to allow them to make important decisions is key to our success with built-in work. Remember that homes are always a work in progress; every custom touch brings them one step closer to your ideal living space. 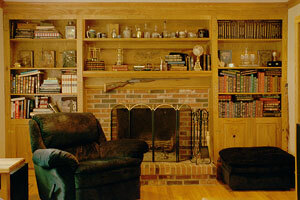 Many of our customers return over the years, each time adding one more custom item to their home. Whether one corner is bare, or a whole room of ornate woodworking is your vision, we are at your service. Please note, built in furniture requires on-site installation, for this reason must limit our services to within two hours of the Princeton, NJ area unless special arrangements are made. 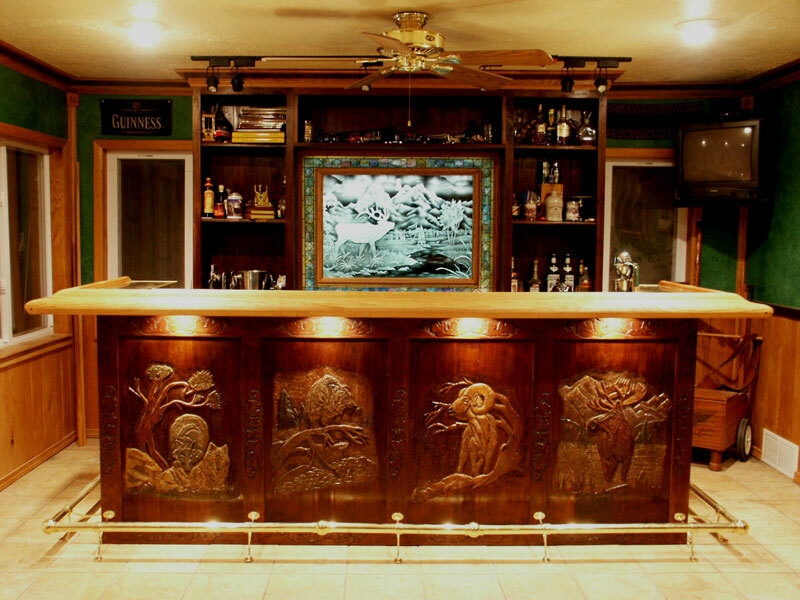 However, we're always happy to work with other craftsmen to provide hand carving or detail work on projects throughout the US or worldwide.